A breakthrough process for ready mixed gives John Cook, director of Technical Services at Atlanta’s Thomas Concrete, cause for enthusiasm this construction season. In late February, he and his team oversaw the installation of the CarbonCure Ready Mixed Technology at their Doraville, Ga. plant. They immediately began the process of lowering cementitious material content and dosing concrete mixes with carbon dioxide (CO2) gas using the CarbonCure injection system. Later in March, Cook and colleagues eagerly reviewed the 28-day strength data and confirmed: CO2 may be used as a viable cement replacement. 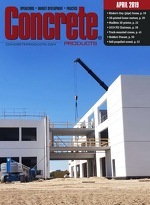 With a balance of residential and commercial concrete work, the Doraville plant—northeast of Atlanta, near the Interstate 285 beltway—is well suited for Thomas Concrete to measure the CarbonCure technology’s cement-optimizing potential in a range of mix designs. Portland cement production creates 2 billion-plus tons of CO2 gas each year, which equates to about 5 percent of global greenhouse gas emissions. The cement and concrete industry has been diligently working to reduce its carbon impact by adopting supplementary cementitious materials (SCM) such as fly ash or slag. With the ability to augment the hydration reaction that gives concrete its strength, SCM are widely considered effective, economical and sustainable alternatives to portland cement. Testing performed at Thomas Concrete now shows that through the application of the CarbonCure technology, carbon dioxide may enable further reduction of cement content. Based in Sweden, Thomas Concrete operates 133 plants across Germany, Poland and Norway, as well as in Georgia and the Carolinas. The company’s environmental policy lies at the heart of its identity. The Thomas mandate is to “continuously strive to develop solutions for a sustainable society of tomorrow” and to “integrate all business measures to reach this goal.” It drove Thomas Concrete U.S. CEO Alan Wessel to explore the idea of adopting the CarbonCure technology at the Doraville plant. CarbonCure’s proprietary process introduces carbon dioxide gas during mixing in order to improve concrete’s compressive strength. Suppliers capture CO2 gas from industrial smokestacks; purified gas is then delivered to the concrete production site via pressurized tanks. CarbonCure’s technology injects a precise dose of liquefied CO2 directly into the drum or plant mixer at central mixed sites, or trucks at dry batch operations. Integrated with the batching system, operating the process is analogous to introducing admixtures. Once injected into the concrete mix, the CO2 reacts with calcium ions found in cement to form a nano-sized calcium carbonate particle. Finer than silica fume, the particle acts as a nucleation site for the hydration reaction. This results in higher strength throughout the curing process. Concrete dosed with CO2 using the CarbonCure process typically results in 10 percent higher strength at 1, 7 and 28 days. The CarbonCure technology precisely injects an optimized dose of liquefied CO2 from a pressurized tank directly into a central mixer or truck at a dry batch plant. The Thomas Concrete team, which consisted of John Cook, alongside Technical Services Manager Justin Lazenby, Production Manager Rick Dumont and a handful of technician specialists, participated in a series of industrial trials CarbonCure conducted throughout the spring of 2015. From trial results, the team had confidence in the performance enhancement brought by mixing-stage CO2 injection. When the technology was permanently installed at the Doraville plant earlier this year, the team had no hesitation about immediately reducing the cement content in mixes. The technology was applied to six mixes for residential work, which represents about 40 percent of the concrete produced at the site. Each mix included varying quantities of cement, fly ash, and slag. Approximately 5 percent of the cementitious content was removed in each mix. Throughout the commissioning process, CarbonCure engineers tested a range of CO2 volumes to determine the optimal dose by weight of cement. On average, approximately 1 lb. of CO2 was introduced into each cubic yard of concrete. Fresh properties were monitored and shown to be unaffected by the addition of CO2. Compressive strength testing revealed that even with a reduction in cement content, specimens performed on par, and in some cases better than the control concrete at 1, 7 and 28 days. As of late February, every cubic yard of residential concrete made at the Doraville plant has been produced using the CarbonCure technology, and Cook is already looking to expand its application. Beginning with performance-based commercial mixes, in addition to residential orders, he believes the process is immediately applicable to about 50 percent of his production. In the longer term, the Thomas team intends on driving specifications for the use of CarbonCure in large commercial work. Commercial development has rapidly evolved over the past decade with respect to sustainability. In 2005, approximately 2 percent of the total commercial construction market was built with specific sustainability metrics in mind. By 2015, green-minded design was estimated to comprise over 50 percent of the construction market. With the rise of Generation Y and Millennials buying property and entering the workplace, average Americans are now more eco-conscious than ever before. Additionally, the definition of what is considered “sustainable design” is changing as environmental accreditation or rating programs such as LEED and the Living Building Challenge continue to evolve. LEED v4, which will officially come into full effect October 2016, emphasizes transparency into the environmental impact of building materials. In other words, building products like concrete will be under scrutiny for impacts such as the amount of CO2 emitted throughout the manufacturing processes. The concrete industry has already begun to feel the effects of the rising focus on sustainability. While concrete has many favorable environmental properties, not the least of which includes its resiliency and longevity, the industry faces a growing concern from designers for the cement production carbon footprint. Conversely, building materials that are viewed more favorably by the green design community, like wood, have realized increased market share in recent years. Thomas Concrete/Doraville staff can operate the CO2 injection system on a touch screen panel integrated with the batch control system. Wessel believes that the leadership Thomas Concrete displays with regard to sustainability will help shift the green design community’s perception about concrete. The producer has long focused on providing high quality products with reduced environmental impact. Initiatives such as clinker substitution and using recycled glass as aggregate material had previously been introduced. With the adoption of the CarbonCure technology, CEO Wessel intends on promoting the carbon footprint reduction benefit to the design and construction market. The CarbonCure technology reduces the carbon footprint in two ways. Firstly, when the CO2 is introduced into the concrete mix, it chemically converts into a solid calcium carbonate mineral, which becomes embedded within the concrete. The gas will never be re-emitted into the atmosphere because it no longer exists. Secondly, the reduction of cement content eliminates the carbon footprint associated with the production of that powder. For Thomas Concrete, about 14 lbs. of CO2 will be saved for every cubic yard of concrete produced. A 9-yd. load of ready mixed will therefore save about 126 lbs. of CO2. To put it in perspective, every 20 trucks of concrete will save the same amount of CO2 emissions as an acre of forest will sequester over the course of a year. This message has been shown to entice design professionals. The CarbonCure Masonry Technology has been utilized by block and paver producers across the U.S. and Canada since 2013. Concrete masonry producers rely upon the carbon footprint reduction to differentiate their products and drive specifications. Wessel intends on pursuing the same differentiation strategy. As for John Cook, excitement about replacing cement for CO2 is palpable. Not only does this help the company achieve its sustainability objectives, the cost of CO2relative to the cost of portland cement removed is significantly less. With the 28-day concrete test results confirming the technical services team’s work, he is exploring options to install the CarbonCure technology in other Thomas plants.